A popular Nepali folk singer was forced to remove a satirical song on corruption from YouTube after the youth wing of the ruling Nepal Communist Party (NCP) allegedly threatened him. Pashupati Sharma released a video of the song "Lutna Sake Lut, Nepal Mai Chha Chhut" (loot whatever you can, since that's allowed only in Nepal) on 16th February 2019. The song immediately struck a chord with the people angered by widespread corruption in the country. Many showed their support for the singer on Twitter where some denounced what they called the undemocratic approach of the ruling party. Sharma said he took the video down after he received threatening calls from members of the Youth Federation of Nepal, a student wing of the NCP. He said “they objected to certain words of the song, so I removed it [from YouTube]”. The youth wing also issued a circular addressed to its cadres to protest against the song by Sharma in all districts across the country. "Deleting the popular satirical song has exposed the government's fear over its citizens, and fear over citizens' right to freedom of expression. It is a brazen attack and intolerance the government is showing to the practitioners of freedom of expression. The growing attacks on freedom of expression both in laws and practices show Nepal's democracy is exposed to threats day by day." A day after the video was removed from the web, activists flocked into the capital Kathmandu and danced to the song on loudspeakers, local media reported. In January 2019, the Federation of Nepali Journalists (FNJ) said that 2018 ‘was not an easy year for media houses and journalists as the government frequently targeted them in an attempt to control press freedom’. The organisation recorded as many as 58 cases of press freedom violations. At least 15 journalists were attacked, and 13 others threatened for their work. Similarly, 12 journalists were intimidated or harassed in the course of news reporting or due to publication or broadcast of news. Journalist Tej Bahadur Khadka, who worked for Bajura-based Radio Budhinanda and was also a member FNJ Doti Chapter disappeared on his way home in August 2018. Six journalists were arrested in 2018. Among those arrested include Gopal Chand, the editor of an online news portal postpati.com. Chand was arrested on 27th November 2018, in Kathmandu under the Electronic Transaction Act for publishing news that a local in Chitwan district attempted to attack former prime minister Pushpa Kamal Dahal who is now a co-chairman of the ruling Nepal Communist Party, during a meeting. The police accused Chand of ‘spreading false information’ and charged him under the Electronic Transaction Act. Other journalists arrested and charged under the same Act included Raju Basnet and Anjila Sapkota. On 13th February 2019, a new bill was tabled at the House of Representatives that shall restrict civil servants from sharing their views through media including their micro-blogging sites. The Federal Civil Service Bill proposes strict provisions for civil servants which will remain in effect even after their retirement. Clause 75 of the bill restricts them from criticising the government. It states that '[No] civil employee shall, on his/her real or pseudo name or anonymity, publish any feature article, provide any news to the press, broadcast a speech through radio or television etc, make any public speech or publish any statement via broadcast or social media in such a manner as to be contrary to the policies of the Government of Nepal or to undermine mutual relationship between the Government of Nepal and the people or the relationship with any foreign country'. On 20th February 2019, Nepal's government tabled draft legislation that would impose harsh sanctions for 'improper' social media posts, igniting concerns it could be used to suppress freedom of speech and stifle dissent. Under the proposed law, the government would have the power to block social media platforms like Facebook, Twitter and YouTube unless they register in Nepal. Under the proposed law, the government can also instruct social network site operators to remove posts. Failure to do so could lead to a three-year jail term and a fine of 30,000 Nepalese rupees (USD 262). Social media posts deemed defamatory or against national sovereignty could be punished with up to five years in jail and a fine of 1.5 million Nepalese rupees (USD 13,000). No time frame was given for passing the bill, but activists have described it as an attempt to shackle criticism of the powerful communist government, which has a two-thirds majority in parliament. Your support and your voice matters. On 30th November 2018, at least 30 people – including members of the board of Amnesty International Nepal, staff, and supporters – were detained while protesting outside the Indian embassy against the Indian government’s crackdown on civil society, including raids on the offices of Amnesty International India and attempts to shut down its campaigning in the country. On 30th November 2018, police intervened in a peaceful protest and arrested 12 activists for pasting posters on utility poles in Maitighar. 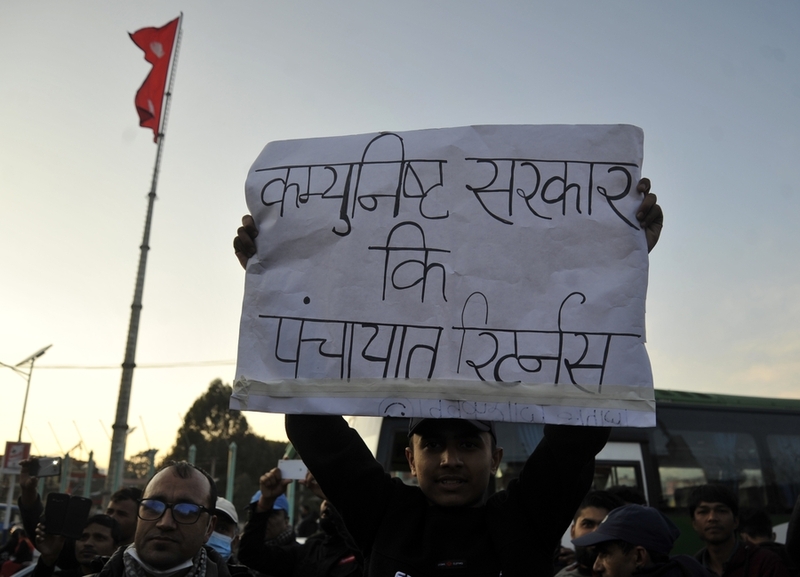 The demonstrators were pasting posters featuring Nirmala, a 13-year-old girl who was raped and murdered in Kanchanpur district in July 2018, demanding that the government bring to book the perpetrators. While the peaceful protest was under way, armed cops arrived and arrested activists, including eight women. Police also confiscated and tore up the posters. The arrested protesters were forced into a police van and taken to Metropolitan Police Circle, Singha Durbar, before their release in the evening, said Pritam Subedi, one of the protesters. Deputy Superintendent of Police Hobindra Bogati claimed that the activists posed a threat to security arrangements made for the Asia Pacific Summit being held in Kathmandu. Over 6,000 cops were deployed to oversee security of foreign delegates.